Making your own tortillas adds tons of flavor to your tacos, and is easier than you think! 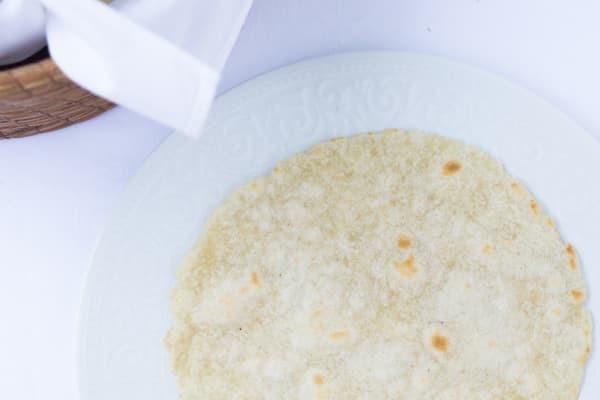 This 20-minute recipe delivers a gluten-free version of tortillas de harina (flour tortillas), a staple of Mexican cuisine. Gluten-free flour mix is the main ingredient in this version, and xantham gum adds elasticity. Use them as a base for your next taco night. They're equally delicious with fish and carne asada tacos, chicken fajitas, quesadillas, and sincronizadas. Cooked tortillas will keep in the refrigerator in a sealed plastic bag for up to one week. For the metric version, use 200 grams gluten-free flour mix, 25 grams butter, and 140 grams water. Weighing your ingredients with a kitchen scale allows for much more precision than measuring by the cup. You can find scales in kitchen stores, or online. Once you start weighing your ingredients, you'll find you get better, more consistent results with baked goods. Per Serving: 498 calories; 11g fat; 86.7g carbohydrates; 11g protein; 27mg cholesterol; 1509mg sodium. Ever since my mother announced she's gluten-free, I've had to stop complaining and start embracing the ways of gluten-free. Recipes and flour blends are more plentiful nowadays, which is great. Make sure you follow that Mealthy Tip and find the right flour mix with the right ratios! I didn't have a comal handy to fry my tortillas, but I did have a skillet and that worked just fine! I'm excited to get my mom's stamp of approval on these, because I think they're great! Being gluten-free was a huge obstacle at first, but now I am finding so many recipes. I had one for tortillas in a cookbook and it failed so miserable that I was hesitant to try this one, but it went really well. I just used the skillet and they were so delish.